It has started! My first book of the year is finished. I found this book called Lab Rats and noted that it was quite new and got good ratings on Goodreads. So I wanted to see what it was about. Here's what I found out. Dan Lyons makes a great speech about how current tech companies are ruining the industry for not only employees, but for everyone. He makes good arguments on why we should stop just adopting the so-called newest tips and tricks about modern management. I agree that we should stop firing people for no real reason. That we should go back to a company style where we would check whether someone who isn’t right for the job might be right for another one. I know some people who have had the same unfair fate. Dan Lyons was going for a great book, but then he kept raging on and on and on. Near the end of the book, it gets a bit boring. I felt like it was getting too much. The point is made after half of the book. And that’s a pity. Apart from that, I was very amused to see that also Dan Ariely is researching the subject. That made me a lot more happier. After this book, I only have one conclusion: every manager, CEO or possible future CEO should read this book. While not all parts are 100% interesting, it’s still worth it. That’s why I rate this book ✩✩✩✩! 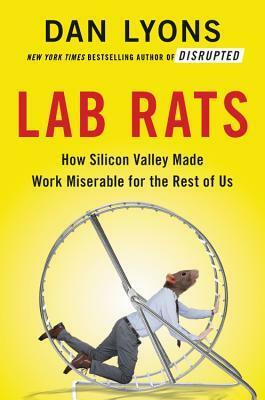 Have you read Lab Rats: How Silicon Valley Made Work Miserable for the Rest of Us? What are your thoughts about it? Let me know by leaving a comment!